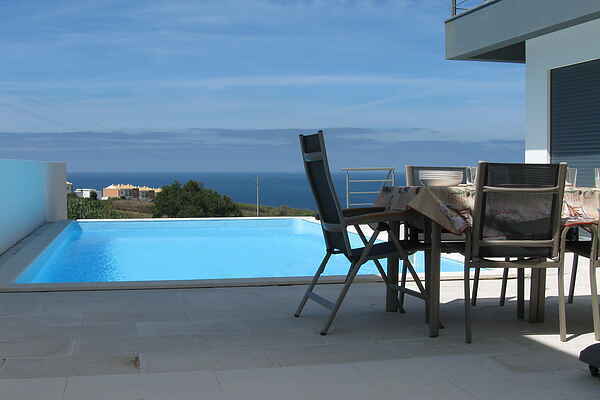 Stylishly furnished new villa with private pool, sea views and within walking distance of the beach and the village with all amenities Atalaia. The villa is spread over three floors. On the ground floor there is a spacious living room with dining area and lounge with flat screen TV and DVD home system. There is a fully equipped kitchen with dishwasher, oven, microwave and ceramic hob. There is a separate toilet classification hal.De bedrooms are on the first floor. One bedroom has a double bed with ensuite bathroom with shower (hairdryer +) and toilet. The second bedroom also has a double bed and the third has two single beds. The second bathroom on this floor you are equipped with shower (hairdryer +), bidet and toilet. In the basement is a third bathroom with shower, a large laundry room (washing machine, dryer), storage room and a recreation room with an extra sofa bed for 2 personen.De villa features a double terrace with garden furniture, sun loungers, garden furniture and private pool. There is free wireless internet and satellite TV. The village Atalaia is at walking distance and has modest shopping and dining facilities, pharmacy , ATM. Lourinha, three Km away has several supermarkets, a fresh food market , several shops and restaurants , banks , museums, etc. Araia Branca 4 km away has wide beaches, good facilities with surf school and excellent surfing facilities. Here you can also eat in the summer delicious Portuguese tapas ( petiscos ) . The walled old city of Obidos and other picturesque places such as Torres Vedras and Peniche are nearby. Less than 30 km away there are five golf courses , including the number one of Portugal Praia D'el Rei " and at a good 45 minute drive you will find the beautiful capital Lisbon and Sintra . Furthermore there are beautiful wine trails in the vicinity , wine route Obidos and Oeste . Sportfacilities nearby, including swimming , snorkeling, fishing , paragliding carting , windsurfing , etc. In short , there is plenty to do in the vicinity of this villa which offers all the comfort and luxury in the very quiet town of Atalaia .